In FNAF3 there is only one real animatronic doll and six dolls in the form of ghosts. Although the ghosts are a major threat, it is necessary that you keep both eyes Spring trap, since he can only kill you. From the second day, especially after the third hour of the morning, he will begin to move more often to achieve it, and many times is not easy to locate Spring trap. Depending on the camera in which he appears, you can see only his feet. Stay tuned. In the third version of the game you have a powerful ally against Springtrap: the audio system. Now it is not necessary to change the camera so that the puppet moves. A strong static fills the camera and when he returns the doll is no longer there. If you are viewing the camera when Springtrap disappears, turn the sound system to call you back. In a few seconds he will return the camera, giving you a few more minutes of advantage. The ghost dolls as Chica, Fox and Puppet continue to hunt you down in the game, yet in its spectrum. 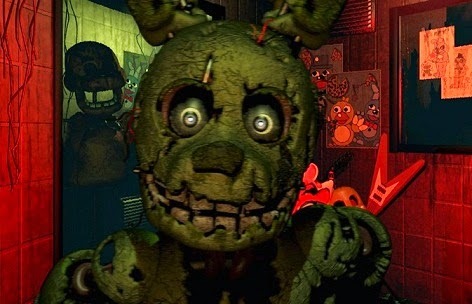 None of them can kill you, but when they arise, disable important systems for you, giving chance to Springtrap get closer - not counting the big scare that may cause you. Most of the dolls are to presage a figure with their shadows inside your office. Aside from Chica, which appears after a distorted and macabre image of it appears in the CAM 07, and Balloon Boy, that momentarily blocks one of the cameras, the other animatronic puppets only attack you if you stare at his figure, especially Foxy, who limped walk out the office window. If you keep looking and she realizes doing it, will come into your room and scare you. Although they are very important - especially in the Night 4 when Springtrap the use frequently - the ventilation ducts should be used with care. If stay closed for a long time, your character will despair of shortness of breath and begin to see hallucinations. Don’t be too aware of the ducts in the early evening. In most cases, when Springtrap's inside them, a characteristic sound can be heard, giving you enough time to seal it.